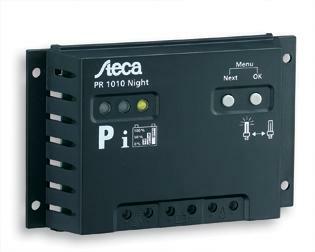 The Steca PR Night is designed for operating automatic night light systems and is suitable for solar systems of up to 300 Wp module output. This controller is thus especially suitable for streetlights, bus stops, advertising lighting and other similar applications. The charge controller determines the actual solar time via the solar module. This integrated clock can be used to define how long after sunset, or before sunrise, the light is to be switched on or off.